How to identify a suitable site for borewell? Vertical Electrical Sounding is one of the very common geophysical methods used for domestic borewell exploration. However, sufficient open area around the location is needed for conducting the survey. Geologists charge around Rs.1,500 to 5,000/- for identifying a borewell site. Other methods of geophysical survey are used in special cases and they are quite expensive. Local well diviners who use wooden sticks or magnetic blocks are also to some extent successful in identifying borewell sites. But this method may not be always reliable, especially in areas where the geological formation is critical. 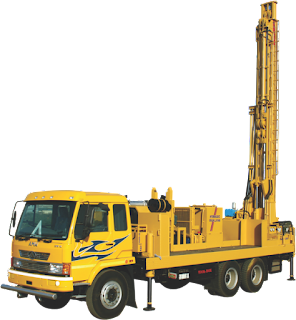 Is there a best suited time for drilling a borewell? As such there is no prescribed season for drilling a borewell if the location of site has adequate ground water potential. However, identifying a suitable site and drilling the borewell in summer months would give the worst possible scenario in the location at the point of time. Therefore, summer months are usually preferred by some experts as the best suited period for drilling a new borewell. Also, as most agricultural sites can be accessed by drilling rigs only during summer months, they are usually available in these periods. What are the common methods adopted for drilling borewells?